Sharing a photograph of a Mumbai street, lined with book stores, Halle Berry said: "Take time to get lost today"
Halle Berry is in Mumbai. It's confirmed. The Hollywood star herself confirmed it with photos from her travel diaries in Mumbai, which were followed up with a post by Dia Mirza. 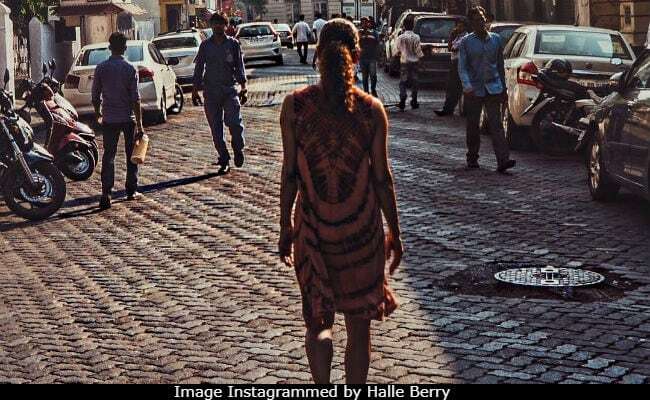 On Thursday, Halle Berry's fans and followers from India arrived on Instagram to find that they may have missed the Bond lady walking the streets of Mumbai. Sharing a photograph of a Mumbai street, lined with book stores, Halle Berry said: "Take time to get lost today." The actress, who also features in the photo, sports a summer dress and has her back to the camera. Instagram, just like us, was surprised to realise she's in Mumbai but quickly regained normalcy to shower her with a whole love of love, from India. "Welcome to India, enjoy your stay," said one of the users while another highlighted that in a city as busy as Mumbai, she may have gone unnoticed "I bet you went unnoticed in those streets." Some even asked if she's in India for a new project. Halle Berry's Mumbai-special photo has over 26,236 'likes' in four hours with comments pouring in on the feed. Later in the day, Dia enlightened us a little bit sharing this photo of herself, Halle Berry and musician and entrepreneur Ananya Birla. Halle Berry had actually announced her arrival in Mumbai with a previous post, in which she wrote: "Caught a sunrise in Mumbai today." Halle Berry is best known for films like Monster's Ball, Gothika, Catwoman and the many X-Men movies she's starred in. Halle Berry witnessed redefined popularity after her starring role as an intelligence agent in Bond movie Die Another Day, which was Pierce Brosnan's last film as the British spy. Halle Berry also has a Hollywood connection to India - she played an Indian character in 2012 science fiction movie Cloud Atlas.